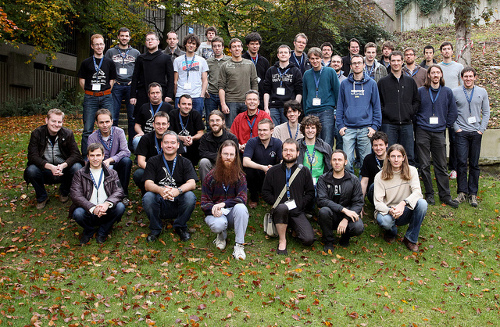 On November 5–7, 2010 we hosted BelHac, the first Belgian Haskell Hackathon, kindly sponsored by Incubaid, Well-Typed, and O’Reilly. 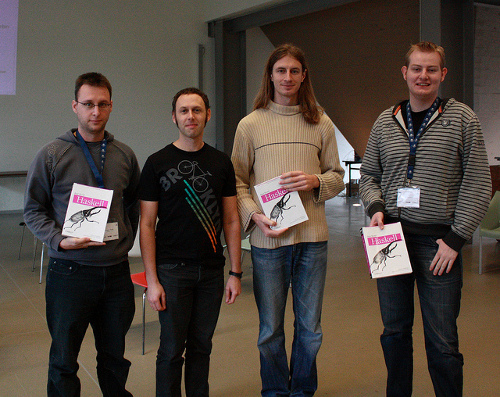 On Friday, we started with a great introduction to Haskell by Miran Lipovača, the author of Learn You a Haskell. A lot of students from Ghent University showed up for this tutorial – it’s good to see that there is an interest in Haskell among students. In parallel, there was some hacking, since some people already knew Haskell. After that, we moved to another (more fancy) building to listen to talks by Duncan Coutts, Romain Slootmaekers and Don Stewart.The talks all focused around “Haskell in the Industry”, and, quoting Don Stewart, “felt like startup school for haskellers”. Perhaps we’ll see some new Haskell startups soon? The talks were followed by a small reception, and after that, some obligatory Belgian beers in nearby pubs. On Saturday and Sunday, the focus was on hacking. We had a small contest: since we had some shiny new Real World Haskell books to give away, we made a list of people who uploaded a package to Hackage during the hackathon. On Sunday, three lucky winners were chosen. I think this hackathon was a success. Patches were added to cabal, to the new Hackage, and, of course, a lot of packages were released. I hope to see everyone again at the next Hackathon!